Who are the Men and Women That Build Communities? Building walls, real walls, is a good thing. Especially if you’re a bricklayer. Your entire job is quite literally spent building walls. Those walls turn into buildings and eventually, those buildings turn into a community. But, who are the people behind those walls that have helped to shape a community? How often do we take the time to get to know the men and women that construct our offices, homes, schools, or grocery stores? And, more importantly, how often do we thank them for the important work they do? Years down the road, will we stop and remember those individuals who have literally built America? 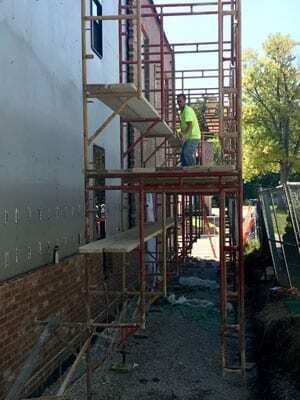 Nearly a year ago, TorHoerman Law announced plans for a new office, and at the end of October, that office will be completed, but it hasn’t been without the help of the worker’s behind the scenes. The reality of a brand-new office was made possible by various construction crews, an architectural team, and lots and lots of hard work. This is where our story intersects with the story of one particular crew – bricklayers to be exact. As the marketing manager for THL, I have been going to the construction site for months now. Initially, my visits were brief and quiet; I simply needed to take pictures to update clients, employees, and community members on the progress of the building. But, those visits became longer and longer as I started to get to know the people helping to make our new office a reality. One particular man stood out from the rest, a man that went out of his way to walk me through the building process, explaining each and every aspect of his work – where offices would be, a sitting space for employees, the reception area to greet clients, a kitchen where meals could be made. But, this story isn’t about me, it’s his story and the connections he has with these buildings. His story is what compelled me to write a three-part series on the aspects of a new building that many of us don’t think about. How much do we truly know about the people who work day after day to build a community? 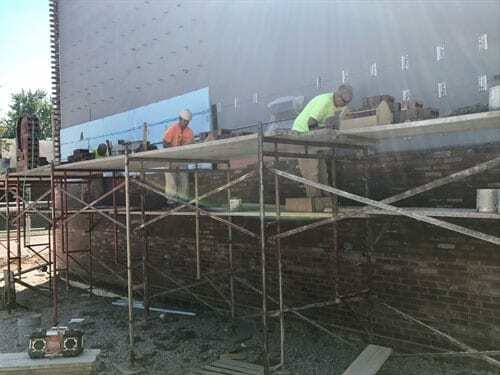 John Lane and his team are bricklayers. While he, and many others, may lay one brick on top of another, the end result is much more impactful. Whether or not he realizes, he is building the foundation of infrastructure, one that helps our country run successfully. His job is more important than many of us recognize. On one of my visits, I brought some refreshments and snacks, simply to say thank you. (I highly encourage you to say thank you to someone who may otherwise not be thanked regularly for their work.) While we sat down to enjoy the treat – but only during the lunch hour because John is a stickler for a schedule – we chatted about the bricklayers’ jobs. My goal was to get to know these men and figure out what makes them tick, what makes them appreciate their jobs, and how they feel about the completed projects that shape our community. And, in that conversation, we got down to the underlying thought process. These men and women love what they do, have the patience to do it, and take pride in their work. The end goal? Go home to their families. When their children ask about their days, they can proudly say, “I built that.” A legacy is left behind. How does someone begin a career as a bricklayer? Is it a passion for building with Legos as a child that leads a person into the trade later in life? Or, is it more of an opportunity of chance? For one the men, who grew up around construction, it’s always been a part of his life and he seemingly has never left because he enjoys the work. Trades were in his blood, but it was just a matter of choosing a specific trade. In the end, bricklaying was the optimal choice because a Union has certain benefits that other industries can’t provide. He enjoys his job and particularly enjoys how each task evolves into a completed project worth bragging about. From 7:30 in the morning to 3:30 in the afternoon, the team of bricklayers lays the framework for buildings around the area. 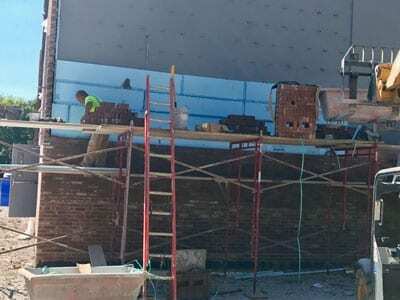 From Springfield, Missouri to Springfield, Illinois, the bricklayers work on commercial buildings, recreation centers, police stations, schools, hospitals, and much more. One of the men’s biggest project to date was the Jefferson Barracks and the Granite City Steel Mill. Bricklayers have a particularly important job, and John Lane, a foreman of the bricklayer team working on TorHoerman Law, is especially proud of the work he’s done on the building. John has a special connection to the law firm, one that makes us very proud to talk about. John is a hardworking, dedicated, kind man. There’s no doubt that he learned those traits from his Mom, Judy Lane. We know this because Judy is a valued, highly-respected member of our THL team and has been for many years, which makes John’s story all the more interesting. As our children age, we hope our children grow into admirable adults who positively contribute to society. For Judy, she knows her son is doing just that. He went into a trade that is positively affecting our communities in many ways. Trades work is important. In the last decade, there has been a sharp decline in the number of individuals in various trades. Seventy-percent of construction companies nationwide are having trouble finding qualified workers, according to the Associated General Contractors of America. But, the work done by these individuals is highly valuable, and without their dedication, the growth of our economy would be at a standstill. John Lane and his team have contributed to and built a new office for TorHoerman Law. After this project is completed, they will move on to the make the dreams of others a reality and continue to improve communities around the area. Their projects vary by the months, but one thing is for certain, the work they complete is a tremendous feat. It’s easy to forget the great things we are capable of and forget to acknowledge the accomplishments of others. It may be a challenge to think beyond the “laying bricks” part of construction to realize that each brick turns into a completed project. In this case, it’s a law firm with a new building that will be able to help unjustly injured people. On the next project, John could be building a hospital, brick by brick, that will cure illnesses. And after, that, he could be building a school that educates our youth. The possibilities are endless, but the meaning behind the bricks are individuals who quite literally help build the infrastructure of communities around the world. Their work will be appreciated for generations to come. Although we’re excited to have a new office, the point of this story was not to promote our firm. It was about connecting with others in hopes of shedding light, with fresh eyes, on the people behind the walls. If anything, I hope this makes you inspired to take a look around next time you’re walking down the street, and ask yourself, “Who built that building? What was their story?”.